This is a good mix which can be used as part of your own mix or on its own. We mix it with Xtra Vital for our rats and they eat most of it. The grassy pellets are pretty much all they leave behind, which is the same with other foods containing those. This mix has different textures, has added dried vegetables such as carrot slices, some peas, and there are also mealworms added. 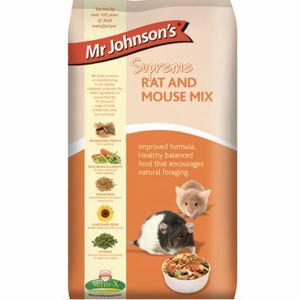 The ingredients list sunflower seeds but the mix contains very little so they shouldn't cause any problems unless your rats are particularly sensitive to them. As far as commercial mixes this one gets our approval. It was tried before adding it to our site.